The Tempest was basically a Typhoon gone good: faster, with a more reliable engine and a crisper handling, together to being a better gun platform without any of the vibration problems of the earlier machine. Typhoon pilots usually transitioned to Tempests without inconvenience, this was the intended policy, while Spitfire IX pilots went on to Spit XIVs. JN751 was among the first 50 Tempests built. It was also the first to score, W/C R.P. Beamont flying it to claim the first Tempest kill, a 109G claimed on “D+2-Day”. 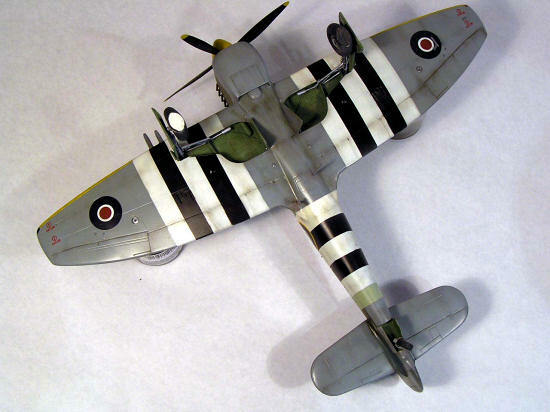 Previous to the invasion, he flew it from Castle Camps, Cambridgeshire (adorned with the Typhoon-like ID bands) within the ADGB (Air Defense Great Britain) in anti-diver missions. In the last days of September, 1944, 150th Wing (274th, 56th and 80th Sqns) was allocated to the 2nd TAF, Beamont leading it to B.60 aerodrome, located at Grimberger, near Brussels. Next month they moved on to B.80, Volkel, forming the five squadron 122nd Wing,and flying armed recce missions to the war’s end. 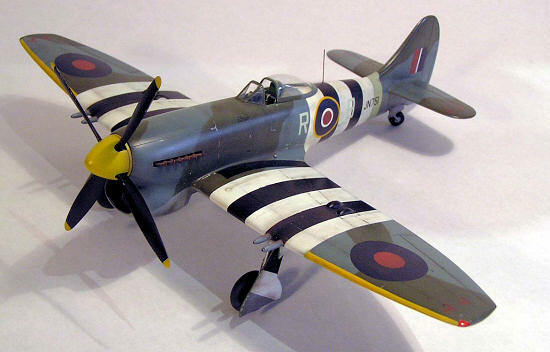 Both Tempests and Spitfires F.XIVs were known as “Superfighters”, the Hawker machine being considered better a low level and also in zoom climb and dive, the Spit being the better at medium to high altitudes and in turning dogfight. There were two boxings of the Eduard Tempest, a ProfiPack which can be built into a late machine, and a standard one, with two early series machines. The latter is devoid of any resin or PE, but the pieces included in the Profipack are not really worth the expense. The kit has been criticized as being too short and having a too thick fin, and both may be true! In addition to that, it is a typical “short run” product, so expect some cleaning and a pin-free assembly. 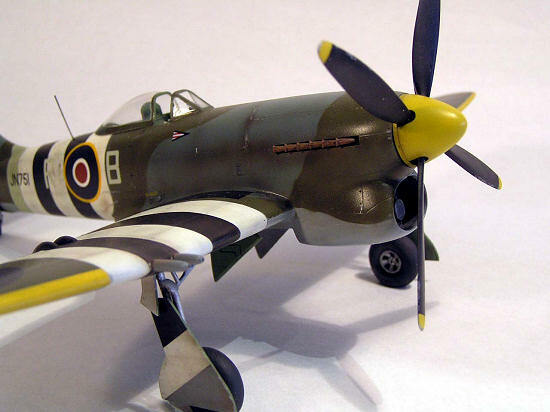 There are a lot of aftermarket items for the Hasegawa Typhoon, but very few for the Tempest. I added an Eduard PE set (48204), True Details wheels (48036) and in the end Eagle Decal roundels and Carpena code letters decals. After pondering several ways of furnishing the cockpit, among them using the tube cage structure from a Hasegawa Typhoon or the even the Cutting Edge resin for such a kit, I decided to go with the Eduard PE piece, gluing tube to the flat structure. After much fiddling, it finally went in, with false sidewalls to hide the wingroots and a false floor to hide the tops of the wheel wells. Some scratchbuilt pieces completed both floor and sidewalls. The fit of the windscreen was exemplary. Exhausts came from the Quickboost range. The wheel wells are well thought as inserts, avoiding the shape issues of the Hasegawa Typhoon. They were also furnished with PE and scratchbuilt pieces, following references and the Cutting Edge set for the Typhoon. I added some bulges in the wing roots which are characteristic of early machines. I resisted the temptation of depicting the flaps down; with all the add ons, the fit of the wings had been crazed enough. It took several attempts to get the correct diedhral: the central under surface should be perfectly flat, and the model insisted in adopting a slight inverted gull shape. I also dropped the idea of replacing the stabilizers for the Airwaves resin pieces, the ones in the kit (though a cumbersome two piece design) fitted well enough. The crazy idea of the wing inserts for the protruding cannon barrels I dropped very quickly; instead, I cut the barrels, shaped a concave base to them, inserted some rod as a guide and glued them to the muzzle holes trying to keep the alignment. It worked, though the soft nature of the plastic made the leading edge joints pop out under the slightest pressure. The interior was painted Interior Grey-Green throughout; though later machines had Black sidewall up the consoles, this is a very early one. The area behind the headrest I left in the exterior colors. 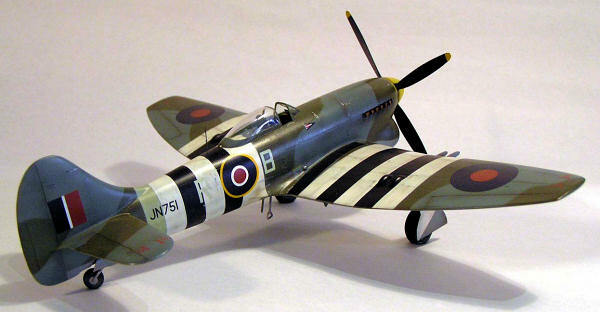 Built for a theme presentation (“From D-Day to Bodenplatte”) this model had to have D-Day ID stripes on it. I chose to paint them first, together with the remnants of the Sky band, and save camo paint and time. I calculated the stripes by establishing the outer limits, painting the surface White and then I measured the stripes, masked and painted the Black ones. There were some inevitable issues, compounded by the slightly too short fuselage, which came out at the time of decalling. The stripes in the real machine were very tidy, applied for the W/C at the Hawker workshop at Langley. I primed and preshaded the whole model before applying the White, getting instant fading, and mixed the Black with some Tan (excellent trick!) to cut some or the sharpness in it. After I masked everything, I painted the camouflage: this is the standard Day Fighter Scheme in DG/OG/MSG, using Xtracolor paints and lightly mottling them over the primer and preshade. The spinner is shown as Sky in the painting instructions, as per the standard ID rules for fighters, but most sources point out that Beamont had it painted Yellow, like he had had in his earlier Typhoon. Well, here some problems presented. The Eduard decals are good enough for a normal build, but this I wanted to be a bit over the top, so I started replacing roundels and flashes for Eagle Strike decals. The Eduard ones had a too bright Red centres, something very common. Then, the code letters are in some shade of Grey, when they should be Sky (another difficult one); moreover, they are the standard measure of 36 in, while Beamont used a smaller size. I resorted to some Decal Carpena 1/72nd codes, but the Xtradecals 1/72nd sheet would have been just perfect. I had to adjust the fuselage bands by extending a bit the most forward Black and White stripes, to allow the decals fall exactly where the photo of the original machine showed (the fuselage is a tad too short, and the White band advanced a bit too much on the trailing edge wing root fairing, though to be fair it seems a bit wider than the rest in the picture). Then I realized that the insignia was centered exactly on a Black/White division, and the White ring was translucent. I tore the roundels away and painted some “dent” in White into the Black band, so that the whole inner part of the roundel fell on a White zone. Geez. The upper roundel is shown as a type C, but in the sheet the correct Type B is included (the order to paint the narrow White ring dated from January 1945) The serials were from the original Eduard sheet and performed flawlessly. Weathering was very light; this aircraft belonged to the Old Man and clean is the way he liked it. Nevertheless I applied some Burnt Umber washes to the underside, that radiator bath should have exuded oil in quantities, W/C or not. I glued the undercarriage, suitably detailed with some oleo pipelines, then the exhausts and canopy and that was it. It was a quite involved build. It must be remembered that those early Eduard kits are nothing like present-day P-39s and Bf 110s, they are true short run kits. I wanted to get it right, and that made the build a bit tense, but I am quite pleased with the results. Ah, the theme contest was won by a good friend of mine with a Tamiya Mustang III from 19th Sqn! - “Hawker Tornado, Typhoon and Tempest. RAF Northern Europe, 1936-1945”, RC Jons, RS Ward. Camouflage and Markings no. 4, Ducimus, England. 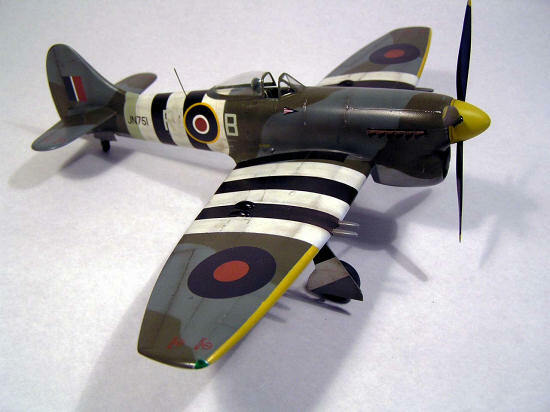 - “The Hawker Tempest Mk. !-V”, Francis Mason, Profile Publications no. 197, London. - “Typhoon and Tempest Aces of WW2”, Chris Thomas, Aircraft of the Aces no. 27, Osprey Publications. 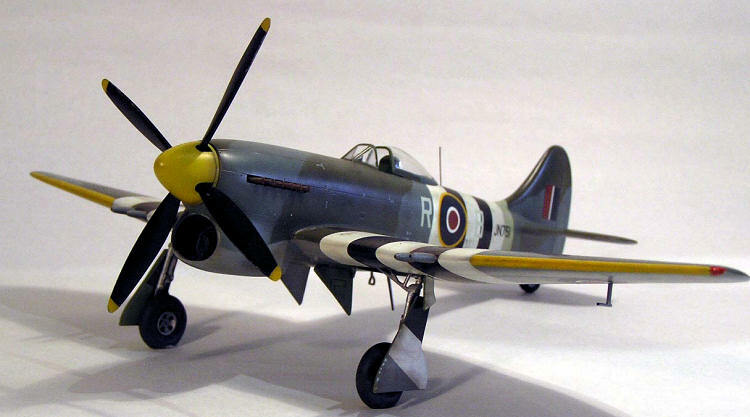 - “Hawker Tempest”, Michail Ovcacik, 4+ Publications, Czech Republic. - “2nd TAF vol 1, 2 y 3”, Chris Thomas y Christopher Shores, Classic Publications. - Plans drawn by Ian Bentley in SAMI magazine.